An amazing 85% of U.S. adults own a cellphone making the device the most popular electronic gadget owned by adults in the States. This information comes from the latest survey by the Pew Research Center's Internet & American Life Project. And while 85% of Americans 18 or older own a cellphone, 90% of adults live in a house with at least one cellphone. 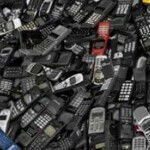 After the ownership percentage of handsets by U.S. adults, the numbers drop off sharply. 59% of American adults own a desktop PC while 52% own a laptop. Showing that tablets have a long way to go before they can be considered a threat to laptops, only 4% of Americans 18 or older have purchased one. Of course, the device is just starting to hit its stride with some high powered models like the Motorola XOOM expected to launch shortly. Beating out the tablet by a hair is the electronic book-reader with a 5% ownership rate among U.S. adults. 47% own an Apple iPod or another brand of MP3 digital music player, and 42% have a video game console. 9% of Americans 18 or older own none of the above-mentioned gadgets. As you might expect, that rate rises to 20% among Americans 66 to 74 years-old and 43% for those 75 and older. The survey was conducted among 3,001 U.S. adults. If anything, I thought the percentage of laptop owners might be around 60%, but interesting nonetheless.